The weather forecast was not so fab for today so we picked a walk that we thought would keep us steadfast using trees for cover and staying low on a coastal walk instead of high in the mountains. We headed to Maelltraeth and parked at the Forestry Commission car park at the very far end of Newborough – the weather was inclement but not too bad. As we setoff heading for the estuary we were initially covered by trees until we “popped out”. We had heard the wind being a little “blowy” over our heads while we were under cover and once we became exposed we realised that “blowy” was an understatement. Heading across the flat dunes to the coastline along the estuary we were blown “hither and thither” but the sun was shining and the day was looking nice. As we hit the beach it all changed and became absolutely bizarre. The wind whipped up and we suddenly found ourselves in a sandstorm the likes of which we had never seen before. I have never before experienced a sandstorm and this was to prove to be an extraordinary one. We knew we had around ¾ of a mile to travel into the sandstorm to turn the corner of the estuary and we hoped then to have sanctuary from the sand. With visibility very poor we made our way forwards. The sand was hitting us at speeds we could not calculate, our lower legs were beaten back by an onslaught of sand while the gale blew the particles of sand at us stinging our faces and making using our eyes quite impossible. Most of the walk was done backwards against the sandstorm but even this proved difficult as we fell over lumps of “things” hidden in the sand, covered by the storm. As if that was not enough, a hailstorm developed within the sandstorm and suddenly were pelted with sand and hail – this proved too much and we headed for refuge within the adjoining sand dunes. After a short search, we found a relatively sheltered trough between the dunes and hunkered down to allow the worst of the storm to pass. We decided this was a good time to take a bite to eat – well, that was an experience….. I had thought I would enjoy the pre-prepared corned beef and salad bap I had but even in our little refuge the storm of sand still found us and a more crunchy corned beef bap I have never had. During this respite I had noted my video camera appeared to have developed a fault and although it was waterproof it clearly didn’t like sandstorms, wind or hail. I noted the display was blurry and the zoom would cause the camera to turn off. I became somewhat vexed as I have lost a lot of cameras to stupidity but I felt I had been careful. Strangely, not long after when we resumed our adventure it seemed to “right” itself and I gave praise to the almighty. 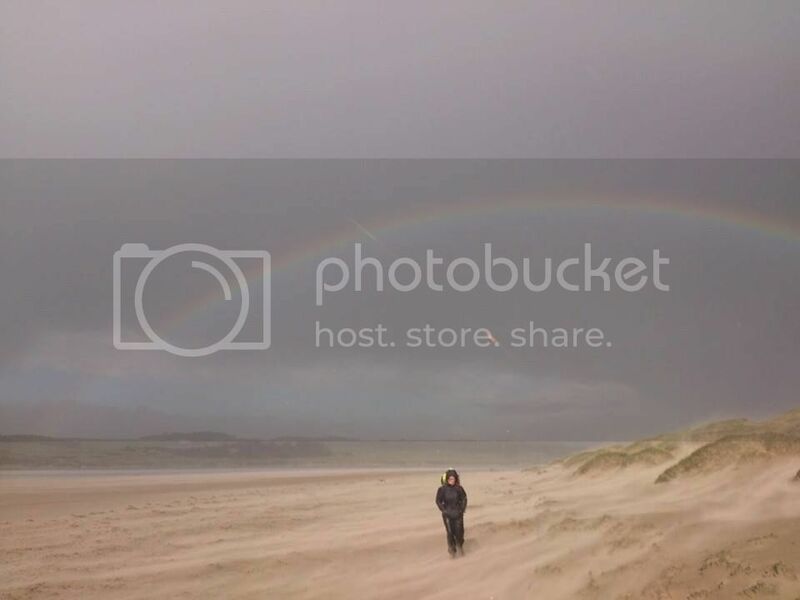 Once the hail subsided we made our way back to the beach where the sandstorm raged unabated and we now faced a rainstorm – much easier than a hailstorm in a sandstorm, I can tell you that for certain. Looking backwards (which was easy because some of us were still walking backwards) we were treated to an awesome rainbow within the two storms. As we cleared the corner of the estuary we left the sandstorm behind and now experienced the wrath of the high seas which were throwing waves as high as small towers – lashing us with spray and rain. This journey lasted over a mile before we reached the small island of Llanddwyn. We knew that high tide would cut this island off from the mainland but we still had a couple of hours and the weather appeared to abate. 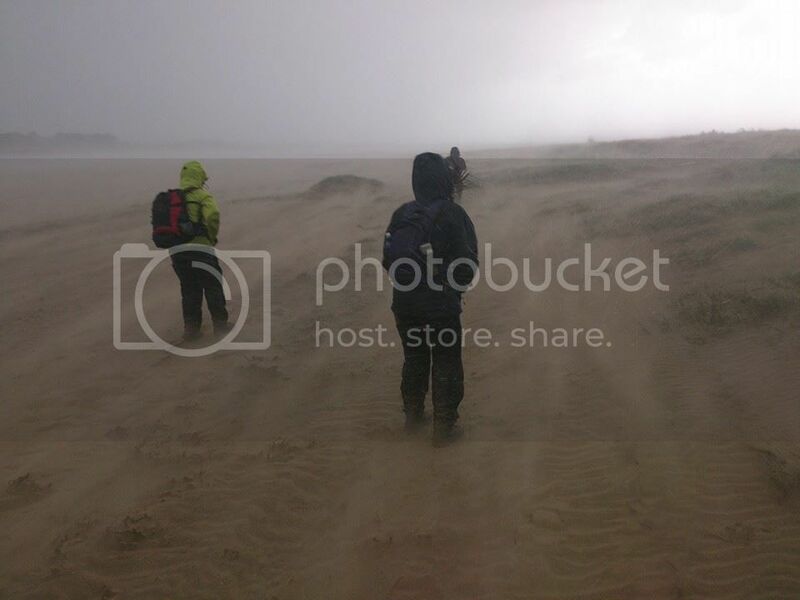 We made our way across the wet sands and headed up the path to reach the island summit where we were greeted with yet another storm – the wind this time was much stronger and it was a challenge indeed just to press forward. Sea spray from around the island filled the winds and we were battered from pillar to post as we made our way with grit and determination to the head of the island. Of course this is a very pretty island with many nice things to see but the weather was so bad, filming was virtually impossible, sight seeing was impossible but we were struck with the utmost awe at the sea and its waves which hammered away at the unrelenting rocks whilst white horses the size of which we had never seen before galloped across the ocean. As we turned around the headland, the island sheltered us from the winds and the sun was allowed to come out – it was not until we reached the mainland that the wind ripped up again bringing sand along behind us as we headed for Newborough forest. Once inside the forest we were completely protected from the elements and the walk back was filled with the chatter of woman gossiping about goodness knows what. We reached the car, disappointed to discover our waterproofs weren’t and we endured a soggy car ride back to a Brewer’s fayre where we stopped off, stinking of sand and sea, for a hot meal and something to drink. About 8.5 miles and many hours – less in good weather ! Last Edit: 5 years 5 months ago by Ian. 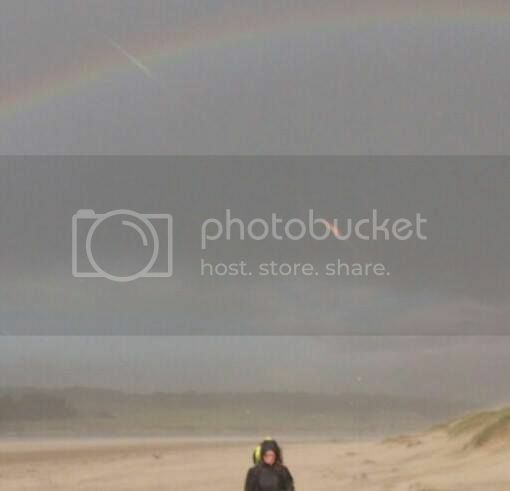 I reckon the "meteor" is some sort of lighting artefact from the lens. If you go through the footage frame by frame (not easy with YouTube...) you will see other flashes of light too. love the opening sequence and particularly the shot at 1:02.